Today’s computers are unimaginably complex, and so complicated it’s nearly impossible for anyone to comprehend everything a CPU can do in excruciating detail. It wasn’t always like this – the early CPUs of the 70s and 80s were relatively simple and can easily be recreated at the individual gate level. CPUs can be even simpler, as [Jack Eisenmann] demonstrates with a single instruction computer, the DUO Compact 2, made entirely out of 74-series logic chips and a bunch of memory. [Jack] has a long history of building strange computers out of individual chips, including a TTL logic CPU and a significantly more complicated single instruction computer. The latest, though, is as simple as it gets. It’s just twenty chips, capable of calculating prime numbers, sorting strings, and everything else a computer is able to do. With every one-instruction computer, there is the obvious question of what instruction this computer uses. For the DUO Compact 2 it’s a single instruction that accepts three arguments, A, B, and C. The instruction copies a byte from A to B, then jumps to the instruction at C. Is it even possible for a computer to add two numbers with this instruction? Yes, if you have massive look up tables stored in 2 Megabytes of Flash and 512 kB of RAM. In the video below, [Jack] goes over how his tiny computer works and demonstrates prime number generation (it’s slow), string sorting (also slow), and displaying ’99 bottles of beer on the wall’ on the computer’s LCD. 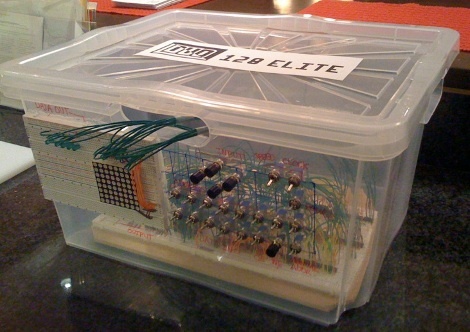 All the files to replicate this computer are available on [Jack]’s webpage, along with an emulator in case you don’t want to break out a breadboard for this one.